Eating right by making healthy food choices is always best, yet it is not always practical for everyone. In the busy lives that do not leave time for proper meal planning and preparation, including a high quality multivitamin and mineral formula into your daily regimen, such as the Daily Active Multiple can help to meet your recommended daily intakes of these necessary nutrients. Achieve a multitude of health benefits in one convenient daily multivitamin supplement. 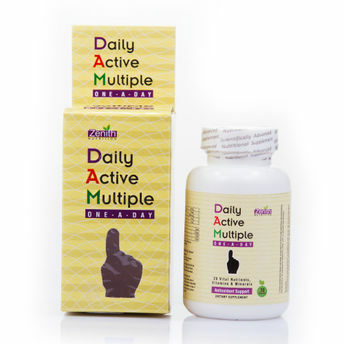 Daily Active Multiple (DAM) delivers optimal daily value of 25 vitamins and minerals, including the important natural ingredients with potent anti-oxidant benefits like Acai Berry, Grape Seed Extract, Lycopene, Piperine and Astaxanthin to promote energy utilization and normal red blood cell production in the body. Just one capsule a day gives the support when it comes to immune, stamina, vitality, cardiovascular and nervous system health. DAM has the right ingredients in optimal quantities and has been formulated by considering RDA. Explore the entire range of Multivitamins available on Nykaa. Shop more Zenith Nutrition products here.You can browse through the complete world of Zenith Nutrition Multivitamins .Alternatively, you can also find many more products from the Zenith Nutrition Daily Active Multiple One A Day Capsules range.